Russian logistics spacecraft. Progress M1 was a modified version of the Progress M resupply spacecraft capable of delivering more propellant than the basic model to the ISS or Mir. Cargo satellite operated by RAKA, Russia. Launched 2000 - 2004. Status: Operational 2000. First Launch: 2000-02-01. Last Launch: 2004-01-29. Number: 11 . Payload: 2,230 kg (4,910 lb). Gross mass: 7,150 kg (15,760 lb). A Russian funded component of the ISS program, the Progress M1 could carry a maximum total of 2230 kg of cargo, of which a maximum of 1950 kg could be propellant and a maximum of 1800 kg in equipment or supplies. From 2008 Progress M's flew with the new TsVM-101 computer in place of the old Argon-16 (introduced on Progress-T in the 1970's) The TsVM-101 was much more capable, much smaller, and 9 times lighter (8.3 kg vs. 70 kg). In connection with this the analogue telemetry system was replaced by a smaller digital system. This modifications was originally planned in the late 1990's, but shelved for financial reasons. However the NII Argon design bureau discontinued production of the old computer, forcing RKK Energia to fund development of the TsVM-101 at NII Submikron in Tselinograd. Progress-M's equipped with the new computers received the new article number 11F615A70 with a new serial number series beginning with 501. The computers were installed in the service module. Family: Logistics spacecraft. Country: Russia. Engines: KTDU-80. Spacecraft: ISS, Mir. Launch Vehicles: R-7, Soyuz-U, Soyuz-U-PVB, Soyuz-FG. Launch Sites: Baikonur, Baikonur LC1. Agency: Korolev bureau, RAKA. Bibliography: 2, 296, 552, 554, 12984. 2000 February 1 - . 06:47 GMT - . Launch Site: Baikonur. Launch Complex: Baikonur LC1. LV Family: R-7. Launch Vehicle: Soyuz-U-PVB. Progress M1-1 - . Payload: Progress M1 s/n 250. Mass: 7,250 kg (15,980 lb). Nation: Russia. Agency: RAKA. Manufacturer: Korolev bureau. Program: Mir. Class: Manned. Type: Manned logistics spacecraft. Spacecraft Bus: Soyuz. Spacecraft: Progress M1. Duration: 85.53 days. Decay Date: 2000-04-27 . USAF Sat Cat: 26067 . COSPAR: 2000-005A. Apogee: 348 km (216 mi). Perigee: 342 km (212 mi). Inclination: 51.60 deg. Period: 91.44 min. Progress M1 was a modification of the Progress M for the International Space Station. The first such spacecraft was diverted to raise the orbit of Mir. 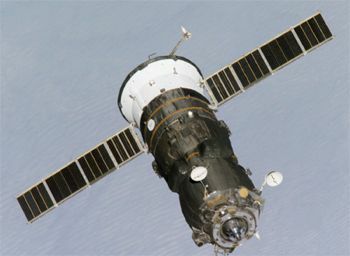 It docked with the unoccupied Mir space station on February 3 at 0802:20 GMT. Burns of its motor to raise Mir's orbit began on February 5 and continued through February 9. Progress M1-1 undocked at 16:33 GMT on April 26 to clear the docking port for Progress M1-2. It was deorbited over the Pacific at 19:27 GMT the same day. 2000 April 25 - . 20:08 GMT - . Launch Site: Baikonur. Launch Complex: Baikonur LC1. LV Family: R-7. Launch Vehicle: Soyuz-U-PVB. Progress M1-2 - . Payload: Progress M1 s/n 252. Mass: 7,280 kg (16,040 lb). Nation: Russia. Agency: RAKA. Manufacturer: Korolev bureau. Program: Mir. Class: Manned. Type: Manned logistics spacecraft. Flight: Soyuz TM-30. Spacecraft Bus: Soyuz. Spacecraft: Progress M1. Duration: 173.00 days. Decay Date: 2000-10-15 . USAF Sat Cat: 26301 . COSPAR: 2000-021A. Apogee: 380 km (230 mi). Perigee: 363 km (225 mi). Inclination: 51.60 deg. Period: 91.98 min. Progress M1-2 docked with the rear Kvant port of Mir at 2128 GMT on April 27. Mir's orbit was raised on April 29 in the first of a series of three burns by Progress M1-2. It later undocked and was deorbited over the Pacific on 15 October..
2000 August 6 - . 18:26 GMT - . Launch Site: Baikonur. Launch Complex: Baikonur LC1. LV Family: R-7. Launch Vehicle: Soyuz-U-PVB. Progress M1-3 - . Payload: Progress M1 s/n 251. Mass: 7,250 kg (15,980 lb). Nation: Russia. Agency: RAKA. Manufacturer: Korolev bureau. Program: ISS. Class: Manned. Type: Manned logistics spacecraft. Flight: STS-106. Spacecraft Bus: Soyuz. Spacecraft: Progress M1. Duration: 86.53 days. Decay Date: 2000-11-01 . USAF Sat Cat: 26461 . COSPAR: 2000-044A. Apogee: 362 km (224 mi). Perigee: 347 km (215 mi). Inclination: 51.50 deg. Period: 91.63 min. Progress M1-3 automatically docked with the International Space Station on August 8 at 20:13 GMT at the rear Zvezda port. The supply ship began refuelling of the station a few days later. It remained attached for offloading of its dry cargo by the STS-106 crew. It later separated from Zvezda's rear port at 0405 GMT November 1 and was deorbited over the Pacific at 0705 GMT. 2000 November 16 - . 00:00 GMT - . Launch Site: Baikonur. Launch Complex: Baikonur LC1. LV Family: R-7. Launch Vehicle: Soyuz-U-PVB. Progress M1-4 - . Payload: Progress M1 s/n 253. Mass: 7,250 kg (15,980 lb). Nation: Russia. Agency: RAKA. Manufacturer: Korolev bureau. Program: Mir. Class: Manned. Type: Manned logistics spacecraft. Flight: Soyuz TM-31. Spacecraft Bus: Soyuz. Spacecraft: Progress M1. Duration: 84.58 days. Decay Date: 2001-02-08 . USAF Sat Cat: 26615 . COSPAR: 2000-073A. Apogee: 363 km (225 mi). Perigee: 350 km (210 mi). Inclination: 51.60 deg. Period: 91.70 min. Progress M1-4 was an unmanned resupply craft that rendezvoused with the International Space Station on November 18. After problems with the automatic system, ISS Expedition 1 crew member Gidzenko took over manual control with the remote TORU system at 0302 GMT. The first docking attempt was aborted when M1-4 was only 5 m from the station at 0309 GMT. On the second attempt docking was successfully achieved at 0348 GMT at Zarya's nadir port. The problem on the first attempt was icing of the TORU system TV camera on the Progress when the spacecraft was in shadow. Progress M1-4 undocked from ISS at 1623 GMT on December 1. Following the mission of STS-97 Progress M1-4 redocked to Zarya's nadir port on December 26 at 1054 GMT. The redocking tested a fix to the software that caused problems in the vehicle's first docking attempt on November 18. Yuri Gidzenko completed the docking manually using the remote control TORU system. Progress M1-4 undocked from Zarya's nadir port for the last time at 1126 GMT on February 8. It was deorbited over the Pacific and reentered at 1350 GMT the same day. 2001 January 24 - . 04:28 GMT - . Launch Site: Baikonur. Launch Complex: Baikonur LC1. LV Family: R-7. Launch Vehicle: Soyuz-U-PVB. Progress M1-5 - . Payload: Progress M1 s/n 254. Mass: 7,300 kg (16,000 lb). Nation: Russia. Agency: RAKA. Manufacturer: Korolev bureau. Program: Mir. Class: Manned. Type: Manned logistics spacecraft. Spacecraft Bus: Soyuz. Spacecraft: Progress M1. Duration: 58.00 days. Decay Date: 2001-03-23 . USAF Sat Cat: 26688 . COSPAR: 2001-003A. Apogee: 215 km (133 mi). Perigee: 151 km (93 mi). Inclination: 51.60 deg. Period: 88.20 min. Mir Deorbiting mission. Launch delayed from January 16 and 18. 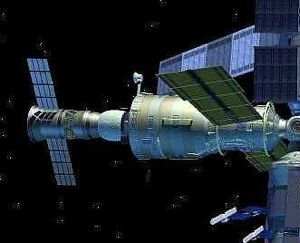 The Mir station had a power failure on January 18, delaying the launch of the Progress cargo ship that was to deorbit it for a few days. Nick-named "Hearse", it was to deliver the 130 tonne Mir station to its cremation over the southern Pacific. Six cosmonauts were on "Hot-Standby" to reach Mir in the event the automatic docking failed. Progress M1-5 carried 2677 kg of fuel. A special three-day fuel-economy approach was be used to keep as much fuel as possibile for the deorbit. Progress M1-5 docked with the +X Kvant port at 0533 GMT on January 27. It later undocked and was deorbited over the Pacific together with Mir on 23 March. 2002 March 21 - . 20:13 GMT - . Launch Site: Baikonur. Launch Complex: Baikonur LC1. LV Family: R-7. Launch Vehicle: Soyuz-U-PVB. Progress M1-8 - . Payload: Progress M1 s/n 257. Mass: 7,250 kg (15,980 lb). Nation: Russia. Agency: RAKA. Manufacturer: Korolev bureau. Program: ISS. Class: Manned. Type: Manned logistics spacecraft. Flight: STS-108 ISS EO-4. Spacecraft Bus: Soyuz. Spacecraft: Progress M1. Duration: 95.67 days. Decay Date: 2002-06-25 . USAF Sat Cat: 27395 . COSPAR: 2002-013A. Apogee: 398 km (247 mi). Perigee: 379 km (235 mi). Inclination: 51.60 deg. Period: 92.30 min. ISS Servicing mission. Launch delayed from February 15 and 28. The Progress M1-8 resupply spacecraft was flown on ISS mission 7P. It docked with the Zvezda module on the Station at 2058 UTC on March 24. Progress M1-8 undocked from the Zvezda module at 0826 UTC on June 25. The deorbit burn was at 1135 UTC, lowering its orbit from 379 x 398 km x 51.6 deg to 50 x 398 km. The spacecraft reentered over the Pacific at 1213 UTC with debris impact near 46 S 144 W.
2003 June 8 - . 10:34 GMT - . Launch Site: Baikonur. Launch Complex: Baikonur LC1. LV Family: R-7. Launch Vehicle: Soyuz-U-PVB. Progress M1-10 - . Payload: Progress M1 s/n 259. Mass: 7,270 kg (16,020 lb). Nation: Russia. Agency: RAKA. Manufacturer: Korolev bureau. Program: ISS. Class: Manned. Type: Manned logistics spacecraft. Flight: Soyuz TMA-2. Spacecraft Bus: Soyuz. Spacecraft: Progress M1. Duration: 117.06 days. Decay Date: 2003-10-03 . USAF Sat Cat: 27823 . COSPAR: 2003-025A. Apogee: 341 km (211 mi). Perigee: 247 km (153 mi). Inclination: 51.60 deg. Period: 90.40 min. Resupply of International Space Station. Additional water carried to meet needs of skeleton crew. Successfully docked with the nadir port on Pirs at 1115 GMT on June 11. It undocked from the station on September 4 to clear the port for Soyuz TMA-3 but then unusually spent a month on an autonomous earth observation mission. The deorbit engine ignited at 11:26 GMT on October 3 from a 247 x 340 km x 51.6 deg orbit, reducing the perigee to 69 km. Progress M1-10 reentered the atmosphere over the Pacific at 11:58 GMT and broke up around 12:05 GMT. 2004 January 29 - . 11:58 GMT - . Launch Site: Baikonur. Launch Complex: Baikonur LC1. LV Family: R-7. Launch Vehicle: Soyuz-U-PVB. Progress M1-11 - . Payload: Progress M1 s/n 260. Mass: 7,250 kg (15,980 lb). Nation: Russia. Agency: RAKA. Manufacturer: Korolev bureau. Program: ISS. Class: Manned. Type: Manned logistics spacecraft. Flight: Soyuz TMA-3. Spacecraft Bus: Soyuz. Spacecraft: Progress M1. Duration: 116.00 days. Decay Date: 2004-06-03 . USAF Sat Cat: 28142 . COSPAR: 2004-002A. Apogee: 263 km (163 mi). Perigee: 192 km (119 mi). Inclination: 51.65 deg. Period: 88.73 min. ISS resupply, to dock at the Zvezda module of the station 13:15 GMT on 31 January. Launch delayed from November 20, 2003. Payload delivered amounted to 2345 kg and included a new flex hose for the Destiny module's leaky window, replacement parts for the Russian Elektron oxygen-generating unit, a spare Elektron, new Russian Solid Fuel Oxygen Generator candles, batteries for the Zarya and Zvezda modules, gas analyser equipment, updated fire suppression and detection equipment, a new Russian Orlan spacesuit, film, cameras, data cassettes and the Matreshka experiment package for installation on Zvezda's exterior during a spacewalk. A few days prior to its departure from the ISS, ground controllers fired the Progress M1-11's engines for 11 minutes, boosting the Station's altitude by 3.7 km and adjusting its inclination by one one-hundredth of a degree. Progress M1-11 undocked from the Station at 11:19 GMT on 24 May 2005, clearing the way for the arrival of Progress M-49. It was thereafter commanded to a destructive re-entry over the Pacific Ocean.